Four MPs were selected to receive 'Sansad Ratna Award 2012' based on the performance in the Lok Sabha as at the end of March 2012. An Award Function was held at Indian Institute of Technology Madras, Chennai (IIT-M) on 14th April 2012 to present the Awards. Mr Gopalakrishna Gandhi, grand son of Mahatma Gandhi and former Governor of West Bengal presented the Awards. Mr Hansraj Gangaram Ahir, BJP MP from Chandrapur and one of the Award winners could not participate on that day in the ceremony due to unforeseen reasons. However, he addressed the audience from Nagpur over mobile. At that time, we promised him that we would come to Chandrapur to handover the Award personally, in the presence of local eminent people. A function was organised at Chandrapur on Wednesday the 10th October 2012 by the local Citizens' Committee of eminent persons. Mr Shantaram Potdukhe (a respected Congress leader and former MOS in Narasimha Rao Govt.) presided over the function. Many eminent people of the city including Dr Ved Prakash Mishra (Vice Chancellor of Datta Meghe Institute of Medical Sciences), Mr Vishnu Prasad Anihotri (well known Educationist) and many academicians, professionals and citizens participated in the function. The auditorium was fully packed with more than 1000 persons. While talking about the institution of Sansad Ratna Award, K. Srinivasan, Chairman of Prime Point Foundation said that Mr Hansraj Ahir was getting the Award for the third time since the beginning of 15th Lok Sabha for his outstanding performance. He also added that till the end of monsoon session Mr Hansraj Ahir had participated in 87 debates, raised 750 Questions and introduced 24 Private Members Bills, making a total tally of 861. Mr Hansraj stood No 1 in the entire Lok Sabha for introducing Private Members Bills, besides being one of the outstanding overall performers of the current Lok Sabha. Out of 288 private bills introduced till the end of monsoon session of the current 15th Lok Sabha, Mr Hansraj has personally introduced 24 bills. He stood No 1 among the entire Lok Sabha for introducing Private Bills. Srinivasan also added that Mr Hansraj was being honoured for the third year in succession, the first two awards in 2010 and 2011 for his overall outstanding performance, including the raising of questions and participation in debates. Srinivasan also mentioned that the members of 15th Lok Sabha were more active than their counter parts of 14th Lok Sabha. While only 89,055 questions were raised in the 14th Lok Sabha during the entire 5 years, 1,03,712 questions have been raised and replied during the current 15th Lok Sabha within 3 years itself. Also he added that Maharashtra MPs ranked first among all states till the end of monsoon session, securing 378.3 points per member, while the national average for the overall participation in debates, raising questions and introducing private bills was 244 per member. The Award was presented by K. Srinivasan and Mr Murugan Muthiah (Convenor of Action 2020) to Mr Hansraj Ahir amidst the cheers of the entire audience. In response to the Award, Mr Hansraj mentioned that NGOs like Prime Point Foundation were closely monitoring the performance of all the Parliamentarians. This had made the members more active in the current Lok Sabha. He also added that recognition like Sansad Ratna Awards motivated them to perform better. Such monitoring would strengthen the democracy, he said. After his response, various citizens groups facilitated him with bouquet. 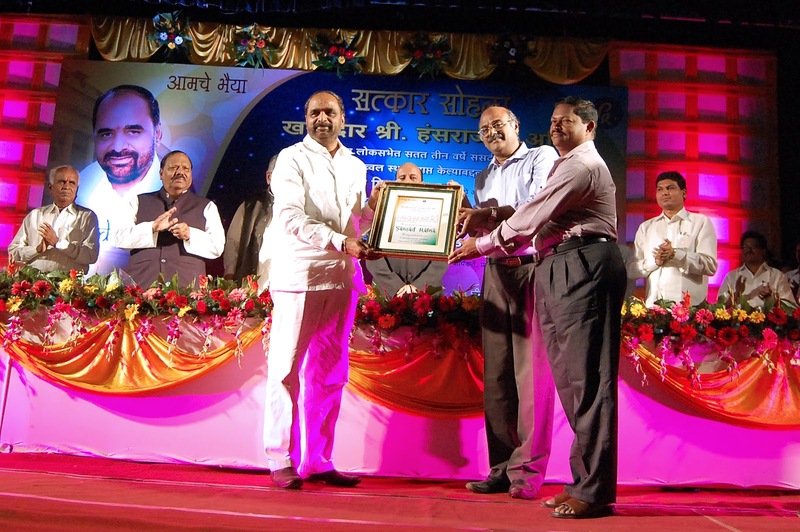 The Award function was attended by many eminent persons of the city Chandrapur, including well known academicians. Mr Shantaram Potdukhe, a highly respected senior Congress leader presiding over the event, where a BJP member was honoured indicated the high level political maturity of the people in Vidharba Region. Mr Hansraj also added more dignity by touching the feet of Mr Shantaram and taking his blessings. Please watch the news report broadcast by City CAble, Chandrapur (10 minutes) featuring this event.